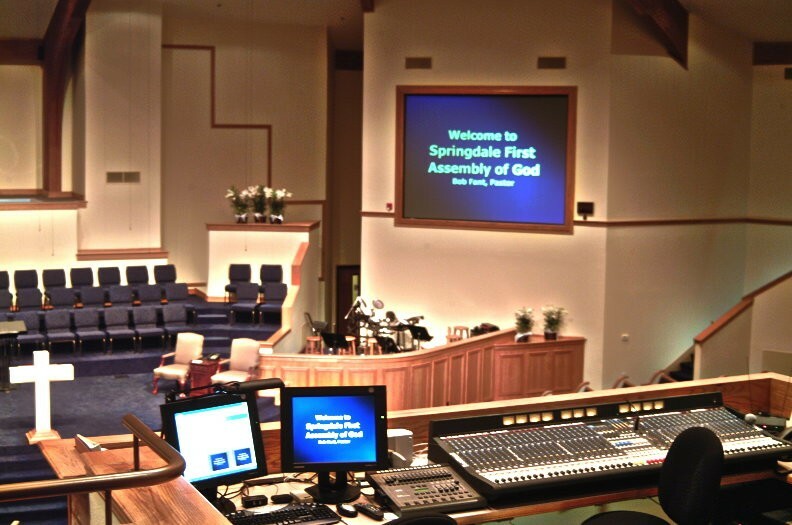 Benson Sound's Sound, Lights & Video Projection installation in Springdale, Arkansas Bob Fant Pastor. Here is the link to First Assembly's web site. Installation includes Allen-Heath ML-3000 40 channel VCA console, 8000 Watts of power on the audio system, Our own designed MyMix14 stage headphone monitoring system, Triple video projection system, dual for audience and single for stage at rear of the sanctuary, house and theatrical light dimming system. Here is a view showing the AV booth. Click here to view some of the building construction photos.